The Radiolaria are a group of unicellular organisms perhaps more commonly met with as prepared slides, rather than in life. As living creatures they can be encountered in the great oceans but more commonly in the Central Pacific. They were discovered in strange and beautiful forms by the research ship Challenger as a huge deposit of ooze on the ocean bed. Radiolaria are placed together with the sun animalcules (Heliozoa) in the phylum Actinopoda. 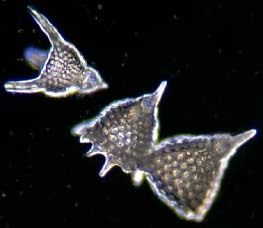 What we call radiolaria are in fact two separate classes that are only remotely related: the Polycystina and the Phaeodaria. But because they are so well known as Radiolaria we will call them Radiolaria for convenience. Like the freshwater Heliozoa they have so called axopods projecting from their cell. They use these to capture prey. But the most striking feature of the Radiolaria is the beautiful glass like skeleton. They are occasionally found in Mediterranean gatherings but since they are constructed of silica they are not normally washed up with the calcareous remains on the shoreline. They are however found on the tourist island of Barbados as fossils in the parent rock there and also there are deposits on other Caribbean islands, as well as Sicily and other exotic sites. Even in Barbados it is important to take a good hand lens or lightweight microscope, because not all the rock is of Radiolaria. With a good X20 lens they can be more or less determined. Large numbers can be obtained from a small piece of "Radiolarian earth"
The soft rocks break down easily in boiling water and immersion in mild acids like citric acid are useful in removing calcareous matter and improving the clarity of the mount later in Canada Balsam. Sieving though 500 micron mesh will remove unbroken pieces of rock and repeated stirring up in water and decanting will also improve the quality of the sample if the heavy sediment is rejected. Panning in a half round dish is also an excellent method of sorting out debris. If the radiolaria are swirled in the dish the debris will tend to gather on one side of the bottom whilst the shells remain in suspension and can be deftly decanted. Before mounting in Canada Balsam it's a good idea to spread the strew with a trace of gum tragacanth in the water in order to prevent the shells from slipping to one side when mounted, dried and stored on edge. The shells are best seen in darkfield illumination when they look like miniature planets. 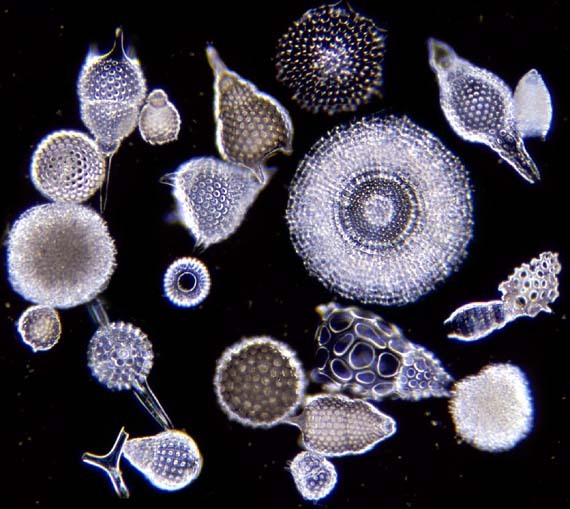 Radiolaria are some of the most spectacular objects for the microscope. Comments to the author Brian Darnton welcomed. Published in the June 1999 edition of Micscape Magazine.